Kalamazoo, MI: On Tuesday, June 14, 2016, at approximately 3:45 a.m., Kalamazoo Pubic Safety Officers Scott Brooks, Kelly Pittelkow, and Andrew Werkema responded to the area Sherwood and Dwight after a concerned citizen contacted police about a possible assault with a handgun. Upon arrival officers made contact with two males who matched the description provided to them by the citizen. 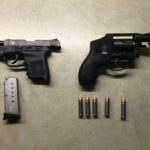 During their contact with the males Kalamazoo Public Safety Officers located suspected narcotics and recovered two handguns. 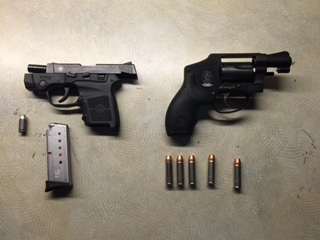 One handgun was found to have been stolen out of Kalamazoo County and the other handgun stolen out of Allegan County. In addition, one male was found to have been the suspect from a felonious assault which had occurred earlier in the day. As a result of this investigation two Kalamazoo men in their 20’s were arrested on the following charges; carrying a concealed weapon, possession of stolen firearm, felonious assault, felon in possession of firearm, possession of marijuana, felony firearm, and outstanding warrants. Both subjects were lodged at the Kalamazoo County Jail. Kalamazoo Public Safety would like to thank and remind all citizens that through collaboration such as this we can continue to keep Kalamazoo safe for all residents, businesses, and visitors.